We are happy today to be posting three more free patterns for the Meet the Board Band Sampler. Margaret Adey is the very hard-working Vice-President of EAC and has the pleasure of living in Newfoundland, one of the most beautiful and rugged parts of Canada. It is no wonder then that Margaret draws the inspiration for her sampler line from the ocean. *please note: The following text and photos are as they appeared in the magazine, and have not be reformatted in order to preserve the context of the original article. This may make this portion seem a little out of order in its instructions, and the materials are what was used in the original . The corner star is worked like this. Taking three threads at a time, work under and over sixteen rows after having gone round three times to form the centre. DRAWN-THREAD work has had a long innings, but is likely to be popular for many years yet. To those who like fine sewing, it is never tedious. For lasting wear and easy laundering it cannot be beaten. This little traycloth can be made any size one likes; the original is 12 x 16½ inches and is made from Excelsior Canvas 36 inches wide. ½-yd. will make two cloths. Ardern’s “Star Sylko” No. 8 is a good strong thread to use; peach (No. 878) and love-in-the-mist blue (No. 783) is a good colour combination, the “stars” and hems being in peach. Tack a 1/4-inch hem to prevent fraying, but do not draw threads for hemstitching until the rest of the work is completed. 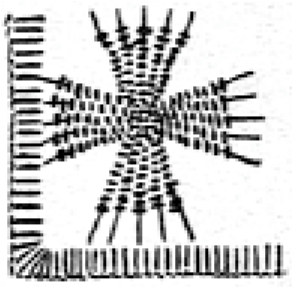 Half-an-inch from the hem commence drawing threads—17 each way, over 11 for the short and over 15 ½ inches for the long side. Buttonhole over the cut edges at the corners taking the stitches over four threads of material. Then hem-stitch into the border taking up two threads. This is done in blue. in very simple stitches in two colours . . .
knot-stitches over the next five bundles of threads, miss three threads, go up to the top of the border, work five knots and repeat until the other end is reached. The next line is commenced just under the first, the thread being taken across the open square to just above where you began the knots in the first row. This time make the knotstitch over two threads of the first bundle and the next knot-stitch over two of the first bundle and two of the second—six knots in all. Take the thread over the same three bundles left before and go on in the same way, working the second row of knots just under the first. The third row is commenced at the bottom of the square; the fourth just above it. 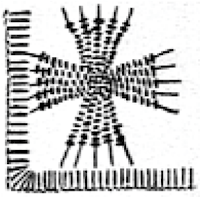 The fifth is worked straight down the middle, dividing the threads of the bundles again, so that the lattice effect is obtained. Excerpt from FANCY NEEDLEWORK, Weldon Series No. 147, October 1938 DRAWN THREAD WORK. Since Isla Marsh is the EAC Librarian, it is not surprising that her contribution comes from a wonderful old needlework magazine. Enjoy this “blast from the past”! Sadly, at last we have come to the last line in our series for creating the Meet the Board Band Sampler. We hope you have enjoyed this series and are having as much fun stitching as the board members had designing. Please share photos of your own samplers you have created using these designs by emailing them to prairie@eac.ca along with permission to publish them. We would love to share your creations on the blog here, the Embroiderers’ Association of Canada Facebook page, or in our magazine, Embroidery Canada. Check back on December 22nd – we will post the entire Meet the Board Band Sampler pattern at that time for your convenience. Thanks for stitching along with us! So many stitches, so little time! Has anyone managed to stitch the sampler yet?